4-2 In the Era Before WWII, Was Korea Just a Part of Japan? Originally the word “colony” referred to land that had been newly economically developed by the people of another area, another country. In other words, something similar to reclaimed land. Nevertheless, the world “colony” came to be used in history starting during the imperialism of the 19th century as a concept indicating a kind of governing in which military power was used in an area mainly inhabited by a difference ethnicity in order to dominate that region politically, economically and culturally. From the point of view of the modern legal system, although a colony is a part of a country, it is ruled by a special system of laws different from that of the country itself. Therefore, modern nations with colonies are made up of multiple areas where the legal principles used in the mainland do not apply. Before the Japanese Empire was defeated and it had to give them up, it had several colonies, called gaichi (areas outside the mainland). These included places such as Taiwan, the Kwantung leased territory, Karafuto (Sakhalin), Korea and the Nanyo islands. Governing took various forms that included crown colonies, conceded territories, protectorates, and trust territories. Regardless of what form the governing took, there was no enforcement of the laws setting out the rights and obligations of the people as defined by the Meiji Constitution. Then what kind of legal system was applied in these areas? This chapter explores this issue with a discussion limited to the case of Korea under colonial rule. The chief executive of Korea, the “Governor-General”, was appointed by the Emperor, and was a position open only to a general of the Army or Navy. Although a reform of the system was carried out after the March First Movement of 1919, there are no instances of civil officials becoming Governor-General. The Governor-General was under direct control of the Emperor in commanding the Army and Navy, while in affairs of state he received policy approval from the Emperor through the Prime Minister. Since it was structured so that the Emperor was the only authority regulating the Governor-General, a massive amount of plenipotentiary power became centrally concentrated in the office: legislative, administrative, judiciary, and in addition military. This means that even the ostensible separation of powers guaranteed in Japan was not part of the system installed in Korea under colonial rule. Among these, there was especially a problem in legislative power in the legal system. According to the official position of the Japanese Government when it annexed South Korea, the Meiji Constitution was to be applied. However, the Japanese Government confirmed only formally that the supreme power of the Emperor reached Korea, suspending the enforcement of various rights prescribed in the Meiji constitution. 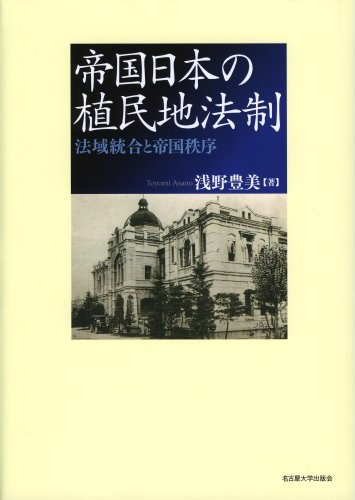 One plain example of this is the complete entrustment of legislative power to the Governor-General, a problem that occurred also in Taiwan (which was colonized prior to Korea), named the rokuju san mondai (Sixty-three problem) after the 1896 Title 63 which gave legislative power to the Governor-General there as well. 1. Laws made by Imperial edict, covering areas such as copyright, patents and public safety. 2. Laws applied only in Korea such as establishment of the Oriental Development Company and a law dealing with bonds and accounting known as the Chosen jigyo kosai tokubetsu kaikei-ho (act on special account for government bonds). 3. Ordinances of the Governor-General of Korea. The ordinances were not limited to enacting rules specific to colonial rule, and in fact they effectively served to continue many laws that had existed in the past, such as the Newspaper Law, and the Public Security Law. Aside from 2, all of the above were given by the Administration on its own authority, even in cases when the content should have been regulated by rule of law. In particular with regard to the Governor-General’s power to issue orders in the form of ordinances, despite wide discussion by the Imperial Diet and among law scholars whether such general legislative power should be permitted to be entrusted to the office, the problem was not solved during the period in which Japan ruled Korea. One more problem with the legal system was that the law changed depending on whether it was being applied to Japanese or to the people being colonized. 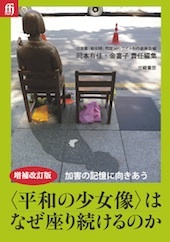 The legal system had a double standard by which application of the law was divided into zokuchi (territory) and zokujin (persons). For instance, the electoral law was applied such that Koreans who lived in mainland Japan had the right to vote in the House of Representatives, whereas Koreans living in Korea did not. This is one example showing how the application of the law differed by area. Not only that, laws were applied differently even within the same geographical area, depending on your ethnicity. For example, the Japanese Empire’s draft system under the Meiji Constitution was based alternatively on the Choheirei (Conscription Act) of 1889 (it should be noted that the first Conscription Act was promulgated in 1873), or the Heiekiho (Military Service Law) of 1927. The applicable Koseki-ho (Family Registration Law) would not have applied to Koreans, as they were governed by the Chosen minseki rei (The Korean Family Registration Law, enacted in 1922; Prior to annexation the applicable law would have been the Minseki-ho [Family Registration Law]), so they would not have been drafted (Note that there were even areas in “mainland” places such as Hokkaido and Okinawa where the delay of their step-by-step incorporation into Japan also delayed the enforcement of the Military Service Law.) 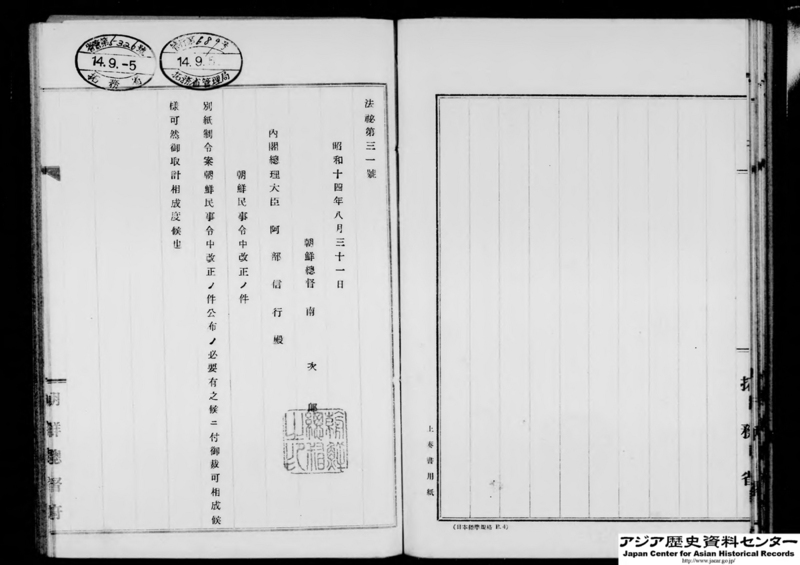 As the 1937 start of the Sino-Japanese war brought a shortage of manpower, the Japanese government altered the Military Service Law in 1943, widening the recruitment range with the Chosen minji-rei (Korean Civil Law), so that people whose family registration law was Korean could also be drafted. So in terms of the draft, the Koseki-ho was applied to Japanese, while the Chosen minji-rei was applied to Koreans. Incidentally, while the Chosen minji-rei was given as an ordinance by the Governor-General, we can also call it part of the Civil Code of Korea under colonial rule. Civil law makes prescriptions about things such as one’s economic life (contracts) and family life (inheritance, family structure). In order to interlock Korea’s economy with mainland Japan, the Governor-General used the annexation to also enforce Mainland Japanese contract law in Korea. But the traditional customs of Korean family law were　left within the civil law. 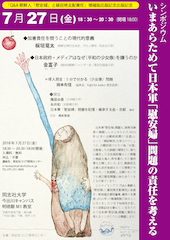 Therefore, different civil law systems were applied to Japan and Korea respectively. In any civil case where there was nothing applicable in the Chosen minji-rei, the Civil Code was applied. In other words, even if the contents were the same as the law of Mainland Japan, they were enforced as ordinances of the Governor-General in Korea. This means that the ordinances specified which portion of the Civil Code was enforced in Korea, so the rights and duties of the Korean people were let to the will of the Governor-General. The notorious soshi kaimei policy by which Koreans were pressured to adopt Japanese names was brought about by a revision to the Chosen minji-rei. As mentioned earlier, this was connected to the enforcement of military service in Korea. So, how were treaties which the Japanese Empire had signed with foreign countries applied in the colonies? How did a treaty affect a colony where a different legal system was applied? There is no uniform practice around the world regarding whether international law directly applies domestically or not, and it depends on the governing system of each individual country. Even today, while there are counties like the United Kingdom and Canada where international treaties only take effect domestically after laws have been enacted, other countries such as the United States and France have constitutions that stipulate for all ratified treaties to apply. Postwar Japan adopted the latter system in Article 98, Clause 2 of the constitution. Although there were various arguments in prewar Japan, since it was specified that conclusion of a treaty is the Emperor’s right by Article 13 of the Meiji Constitution, treaties came to have a direct effect on domestic law. International law prescribed that even if the Mainland fell under a separate jurisdiction from any of its colonies, it was considered to be part of the treaty because it was part of the same territory. This held as long as no declaration was made that the content of the treaty was not expected to apply to the colonies (this is called “suspension”), and the understanding was that the concept of separating the Mainland by giving the colonies unique governing principles was without merit. What this means is that conversely, one could use the legal method called suspension to limit a treaty in its content or with respect to where it was applied. 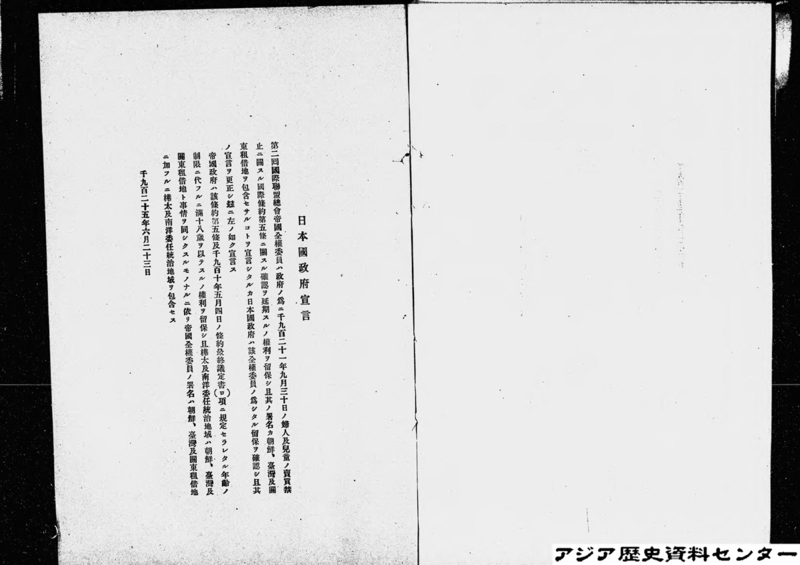 For instance, both the 1910 White-Slave Traffic Act and the 1921 International Convention for the Suppression of the Traffic in Women and Children prohibited those under the age of 21 to work (articles 11 and 14 respectively), but the Japanese government suspended this clause, and excluded application of the treaties to the Korean peninsula, Taiwan and the Kwantung leased territory. Later, in 1927, the age limit would come to be enforced in Mainland Japan, but the exemption was maintained for the colonies.